Wednesday, February 28th, 2018. Posted by Owen Lewis. Infectious diseases are a key driver of honeybee population declines. New research has revealed that these infections can spread between pollinator species that feed from the same flowers. 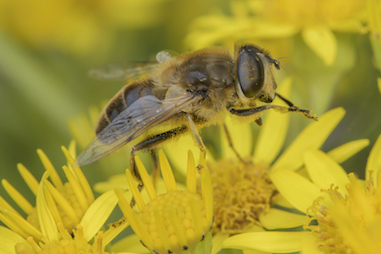 Researchers from the Department of Zoology, led by Professor Owen Lewis, sampled honeybees and hoverflies from woodlands and grasslands near Oxford. When the samples were tested for viruses by collaborators at Royal Holloway University of London the team found that viruses that are harmful to honeybees also occurred in the hoverflies. This is the first time that hoverflies have been identified as having the potential to spread diseases amongst honeybee populations. Professor Lewis and graduate student Kaitlin Deutsch, now based at Cornell University, hope to extend their work to investigate networks of interactions between multiple species of pollinators and their different pathogens. The paper, published today in Biology Letters, can be viewed in full here.